At Westward Ho! beach you’ll discover a harmony of soft sand, mesmerising rock-pools and a scenic pebble ridge. It’s an excellent destination to relax and watch the luscious water crash against the rocks with the sun descending in the distance. But it’s also hugely popular with surfers and people flock here every single year to try and ride the waves. Alternatively, are you a nature lover? If so, you’d love a walk along the back of this long stretch of sand, which extends for just over two miles and merges into the incredible Northam Burrows Country Park. Saunton extends for around three miles, which provides plenty of opportunity for fitness-fanatics, dog walkers and general nature-enthusiasts. Plus, it’s directly connected to Braunton Burrows, a huge collection of sand dunes that rises, in places, up to 30 metres in height! The diversity of flora that exists within the Burrows has earned it a UNESCO Biosphere Reserve status. Be warned though. We've been there for a five-minute walk and ended up lost among the dunescape for almost an hour... it's a huge and beautiful space. Just imagine a vast array of vibrant fishing boats nestled on the water, lovely cottages dotted all around you, and fantastic views that are worth writing home about… that’s what you get with tiny Appledore beach. Whether you’re looking to pass some time with a gentle stroll along the sand, or you want to sit and admire the historic maritime village, then this is a great option. Although busy resorts can often be fun, exciting and bustling, sometimes a peaceful setting such as Appledore is much-needed, don’t you think? If you’re searching for one of the most popular beaches in North Devon, then Croyde Beach meets that criteria. Surfers, holidaymakers and locals all love to utilise this fabulous spot each and every year, due to the spacious feel, lifeguard patrol and brilliant choice of swimming areas. Now, with the popularity, comes a very large crowd throughout the summer. But, don’t feel intimidated, because the atmosphere is always friendly, vivacious and welcoming; everyone just wants to get out into the waves and do so with a smile on their faces. Woolacombe town boasts some excellent pubs, restaurants (particularly the Sri Lankan grub in Barricane), and entertainment. Although, Woolacombe Sands, which is one of the UK’s best beaches, is arguably the main attraction. With three miles of fresh sand – given a Blue Flag label – you can wonder from Woolacombe at one end, to Putsborough at the other. Along the way, you can take a dip in the refreshing ocean, take a look at the stunning landscape and even try to envision the US army practising their D-Day landings in 1944! Jump into a time machine, and go back in history with a visit to Tunnels beach in Ilfracombe. After being hand carved in the 1820s, the four tunnels have since acted as a popular tourist spot. Once you’ve progressed through the historic tunnels, you’ll find a tidal bathing pool, secluded shingle beach and unforgettable views of the rugged coastline. Oh, and don’t forget to explore the plethora of rock-pools which are accessible at low tide, which have been rated the third best in the UK – maybe you’ll end up catching a crab! If you take the short walk down from the picturesque village of Combe Martin, you’ll find a secluded beach, which is full of natural beauty. Although it’s mainly pebbles and shingle, it does transition into sand as you approach the water. Nevertheless, it’s a superb swimming destination, as the protection from some of the highest sea cliffs in England ensure the waves or current aren’t too strong. Enjoy the tranquillity, adventure through the rock-pools, and have a cooling swim, but be careful, as there isn’t a lifeguard service here. 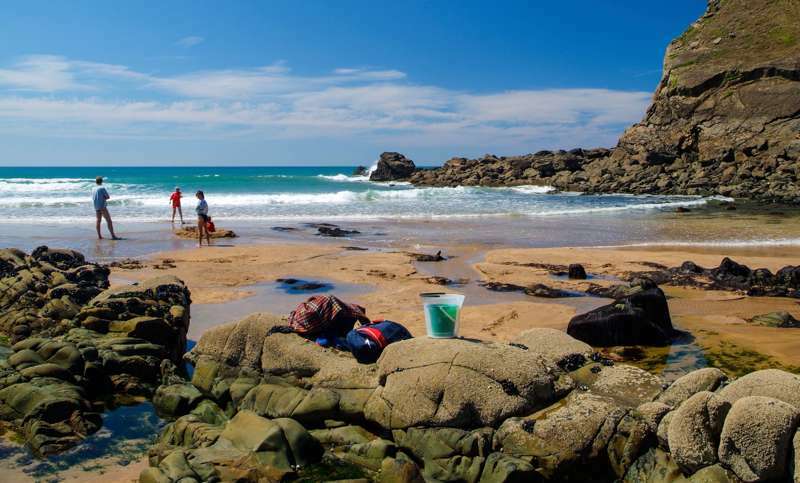 Barricane, or otherwise known as Combesgate beach, is an amazing natural pool in hide tide. But, when the tide retreats, that’s when you can start to make the most out of this little gem. Take a coastal walk with your dog, try and catch the waves with your surfboard, or delve into the many rock-pools (find sea shells which have been carried over from the Caribbean). Ultimately, there’s picture-worthy views, plenty of adventurous opportunities and convenient parking which will provide you with a dazzling experience.